Now, perhaps, the Financial Times will give a respite to the workhorse of Spanish debt and point instead to Spain’s oldest bull-run. Perhaps the best part of the story is the signature on the article. 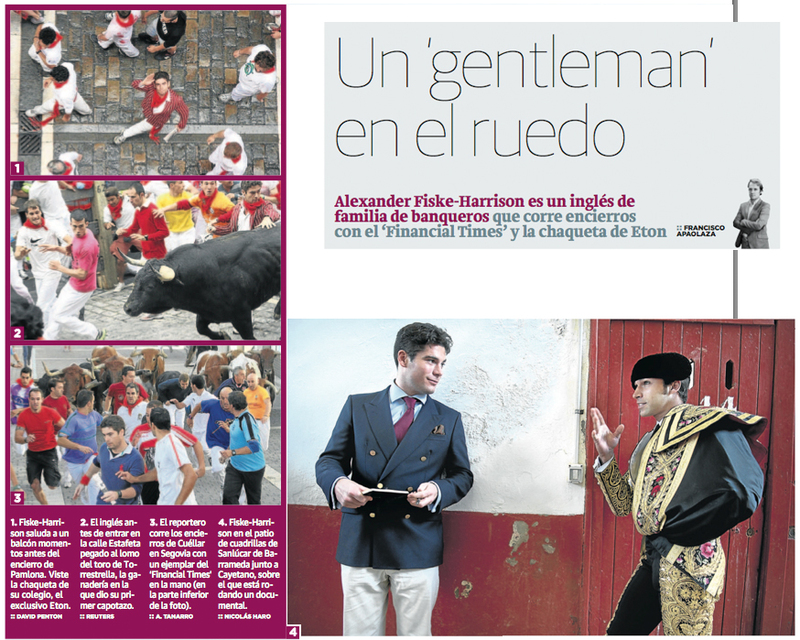 Fiske-Harrison is not the type of tourist who cannot distinguish a cart-ox from a fighting bull, but is an amateur bullfighter whose curious journey began many years ago while search of new cultures and strong sensations. What he found was very far from his life in a grand English family – a line of bankers – with its studies at Oxford, its games of rugby, horses, shooting and the exclusive red and white athletics blazer of Eton College, where Prince William and David Cameron also studied. With all its contradictions and these two sides of the murder and the beauty, the bullfighting bug bit him and bit deep. Thereafter, he began to follow the bulls as an aficionado by plane and car. He also met the bullfighters and went deep inside the curious world of the bulls, thanks in part to his family friendship with Adolfo Suárez Illana, son of Duke of Suárez, the ex-Prime Minister of Spain. From arena to airport, from feria to fiesta, always elegant – a blazer adorned with gold buttons and a carnation in his lapel – he was to be found in every corner of Spain as a bullfighter, as a’connoisseur’ and as a gourmand of a tradition that is not easy to taste. After studying philosophy at the London School of Economics, he published an article about the bulls and animal abuse in the prestigious journal Prospect that caused a huge controversy. “In England there is a lot of hypocrisy toward animals. We killed three or four million cows a year. That is fine, apparently. I just wondered out loud why it is wrong to kill a bull in the plaza and not a cow at the slaughterhouse.” In his view, the key issue is to give “importance to the death of the animals. In my country they do not really care about the animal’s welfare. They just don’t want to see his death, they want someone else to do it, hidden. These ‘animal lovers’ do not care about the bull, but it bothers them that people want to see its death. They only care about the ‘sin’ of the audience.” With these arguments, Fiske-Harrison has become a kind of white knight for the ‘lost cause’ of bullfighting, either on his blog, in the press or on the sets of CNN, the BBC and Al Jazeera. His book Into The Arena was poured like petrol on the the fire of this conflict, and it continues to burn. When he presented it in Oxford, the event was suspended by death threats and the matter came to the attention of the BBC. “It was absurd. An event that would have been seen by a hundred people ended up being heard on the radio by tens of thousands. ” By then, Fiske-Harrison, the last of a family Vikings settled in England since the ninth century, had decided that to know bullfighting, he had to get under the skin of a killer. 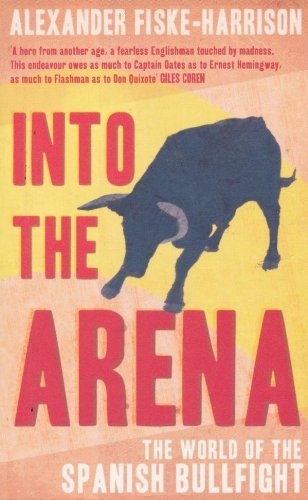 Like a present day Hemingway, like a romantic traveler, a Gerald Brenan or Washington Irving of the 21st century, he slipped to the very heart of the fiesta de los toros. This ‘gentlemen’ was not finished, though. 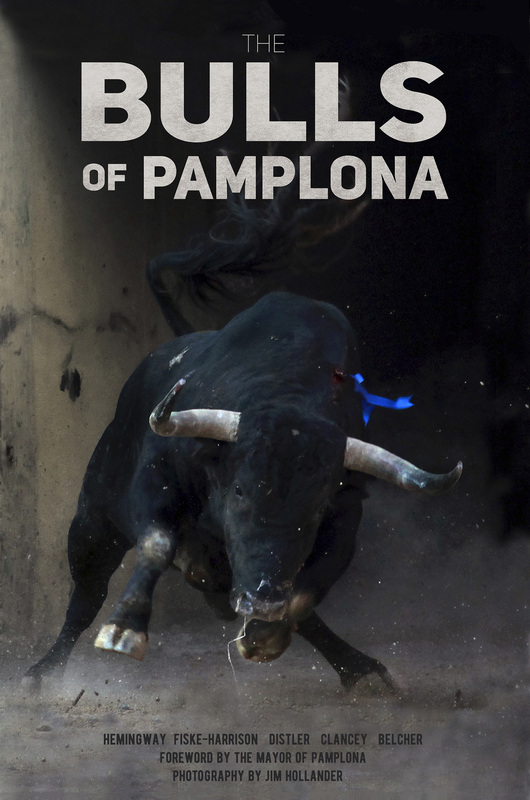 During an interview about his book – in which he claimed he would not return to Pamplona-, the Reuters journalist and bull-runner Angus MacSwan told him that he was wrong about San Fermín, the feria of Pamplona. He had to go back and try “this other form of bullfighting” about which he is going to film another documentary. It was that which led him to get onto the ‘horns’ of Cuéllar a couple of weeks ago with his Financial Times rolled up in his hand instead of a cape. Nor does he miss a single San Fermín. If you look in Pamplona, you will recognize him for his red-white-striped jacket, the insignia of Eton College, flying at full sprint down the middle of the main street, Estafeta.